The coalition Government has cancelled the sell-off of state houses, which was another of its first 100 day promises. Housing and Urban Development Minister Phil Twyford said the move would stop the transfer of up to 2500 state houses in Christchurch. He made the announcement in a state housing area in Miramar, Wellington. 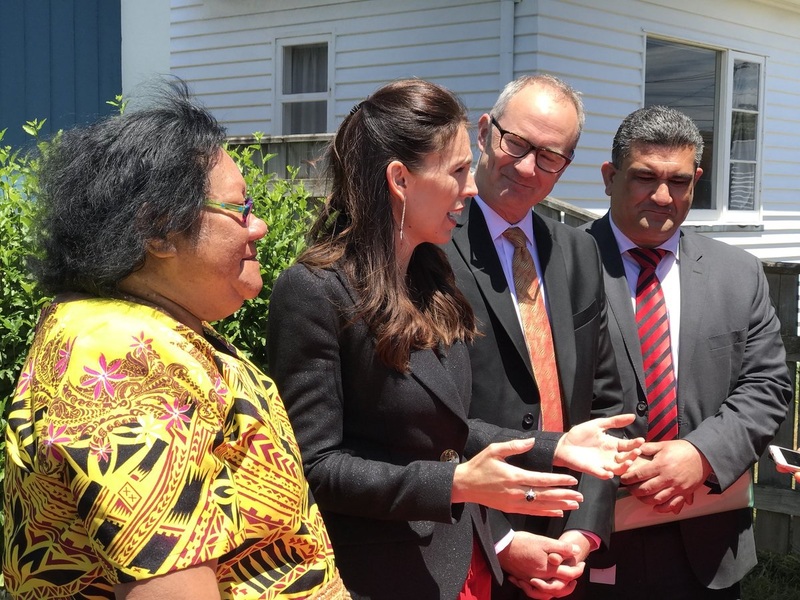 The announcement was also attended by Prime Minister Jacinda Ardern. "Tenants in the suburbs of Shirley, Bryndwr and Riccarton had been told they were likely to have a new landlord by mid next year," Twyford said. "This week they will receive letters telling them their homes will not be sold. "I’m pleased these families will be able to enjoy Christmas without the uncertainty this sale would create." Twyford said that community housing providers have an important role to play in housing those in need, "but the first and last provider of public housing must be the state". “This Government is committed to not only keeping these houses within state ownership, but increasing the number of state houses. And a modernisation programme by Housing NZ will mean more dry, warm and healthy state houses. “While this is the end of large-scale state housing sell-offs, Housing NZ will be rejuvenating its stock by building and buying newer homes where they are most needed and selling houses that are no longer fit for purpose. “Sales to renew and grow the stock are quite different from the systematic large-scale sales used by the previous government to reduce the role of Housing NZ. “Large-scale sales of state houses during a housing crisis do nothing to help house our most vulnerable people,” Twyford said. The latest announcement follows on from Twyford announcing that an interim unit has been established to start work on the KiwiBuild affordable housing programme. Taking the 'first steps' to implementing the KiwiBuild programme was another of the coalition Government's first 100 day promises. OMG a politician who can do basic maths. Makes the last lot look like a bunch of muppets. Me too, I want to learn some Basic Math myself !! Selling them to CHIPS and then renting them back at a rate higher than the government can borrow money for doesn't make longer term financial sense. "the requirement is 20 years access and the rents paid by the individual are capped. In return there is a financial incentive in that the government tops up the rent to the equivalent market rent insuring the provider is not financially disadvantaged"
This way for top up - which is less than the maintenance and upgrade costs they retain the same access to housing stock and support CHIPS to develop additional stock - see todays article as a classic example of how it can happen. Since when has a government agency ever been more effective than the private sector - and especially not Not for Profits who have operated on a shoestring for decades but delivered in buckets ! Which is awesome, but why can't HNZ contract out the management/improvement of the properties to CHIPS, rather than outright sell. As a society we get the benefit of a distributed management of social housing, but retain ownership of the underlying assets. What benefit do CHIPS get from the ownership? In regards to government efficiency, there are some offshoots like City Care that are run very well, and are competitive with the private sector. It should not be the governments responsibility to provide housing for people who need to rent. They have never been very good at it and they won’t be into the future, that is why National were looking at selling some. NZ has a long history of government involvement to address issues where the market hasn't covered the bases. The blanket assertion that they've never been very good at it I don't think is necessarily valid. Arguably, National may have been selling them off for ideological reasons, a preconceived belief. The resort to spending millions on emergency housing suggests it wasn't necessarily done based on sound analysis. It absolutely is the Government's responsibility, Government governs for the country not the rentier class looking to make a fast buck out of a human need. "Government governs for the country"
That's awfully general in nature. You could apply that rational to almost anything at all. Out of context. The key point and a most vital one was "NOT THE RENTIER class". House values and rents will continue to drop in Christchurch. Nonsense, I bought an As-Is property is Chch for $5.37. It might be missing a few walls and is a bit wonky but I have rented it for 6% yield and the value is already up to $10. At last a spruiker that can be truly trusted! show your stats to back up " They have never been very good at it "
..selling houses that are no longer fit for purpose.. Especially if they demand that same standard from private landlords with a home WOF... "If you live in a glasshouse....". I hate ciggie smoke as much as the next guy, but unless you are chewing the wallpaper you really have nothing to worry about. Wash the curtains/drapes, wipe the walls and surfaces down and you'll be fine if the house was previously occupied by a smoker. Does anyone have any info on who actually bought the state houses from National? There was lots of talk about Iwi, Housing societies etc.. I noticed that some of them in the prime location around Orakei have been torn down, and bare plots of land now there instead. Could be delays on the construction of replacements of course, would be interesting to see who managed to get their hands on those goldmines.... I'm sure the sales were all above board, and prime real estate wouldn't have been sold on the cheap to friends or anything. Any addresses we can check? Kupe Street in Orakei, just had a look on Homes.co.nz and I'm assuming 66 to 88 sold for a total of $16.5m, as opposed to $16.5m each that they've been individually labelled as. In addition, HNZ is free to sell of individual properties that do not fit the demographic needs - and utilise the money to either purchase or build alternatives. Due to two decades of inaction and incompetence by HNZ under successive Governments, the transition in teh housing stock that needed to occur has barely started - only in the last three years - leaving a completely unfit for purpose stock. current stock is primarily 3 and 4 bedroom houses - based on the social needs of 40 years ago - the Need is 1, and 2 bedroom units- for the large number of individuals with Mental Health, Offenders, Brain Injury, Intellectual disability and much larger 6+ bedroom homes for some of our very large families, and extended Whanau groups. thanks for the response KP, so you bought State houses or you had rentals that you now use to house those previously housed by HNZ? How much more percentage wise does it cost to house someone at market rate vs via HNZ? When you say large numbers of transfers were to CHIPs, does that mean that some haven't been? Were those transfers at market rate? see above reply - as a company both - and more importantly we have used that as leverage to develop over 50 extra beds and another 60+ currently in process - so more than tripled the beds available - a result that if replicated across the whole stock would have meant 180,000 homes available not 60,000.
the top up is about 15% in most cases - which given that there is no maintenance costs, no costs to upgrade to meet new standards, no costs to maintain the tenancies, rates etc - means its cheaper for the MSD to access a bed than it was before. Much of the issues are that HNZ stock - is full of long long long term tenants, who would never meet the current criteria but were housed 10, 20 and 30 years ago on a house for life promise - this means taht the % of stock that is actually available for emergency and transitional housing is very small - classic bed blocking. Agree. Knuts, thanks for sharing that. That’s much more informative than the light weight piece on TV last night where comrades Ardern and Twyford tried to spin their alternate facts along with a tenant insert about no longer being worried about being turfed out of their house. This government is clueless, chained to leftie dogma, and hopefully going to be out of power before it puts us back a few decades. Well put Ex expat, exactly what I was thinking. The SHOWs they are putting on TV are becoming nauseous and remind us with old communist propaganda material .... just enough to get the sheeples ranting about the glories of a Left gov ..... lol, Talk about basic Math !! Bugger.....thats another 2500 homes FHB won't be able to buy. "the first and last provider of public housing must be the state"
the last provider is the state because who in their right mind would take on some of the bottom of the barrel tenants. BUT if we don't house these families we will pay for it with more social costs elsewhere.